Great Snack for Home or On-The-Go! Lose weight quickly by replacing your high calorie snacks with an IsaLean Bar. This nutritionally complete IsaLean bar snack comes in Chocolate Cream Crisp, Chocolate Decadence, Nutty Caramel Cashew, Lemon Passion Crunch and NEW Dairy Free Chocolate Berry Bliss. IsaLean Bars are packed with whey protein, healthy fats and energy boosting carbohydrates, it’s the perfect snack option! 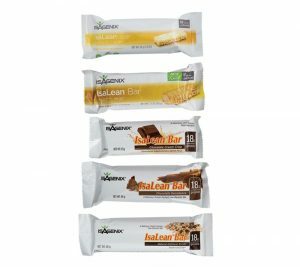 Each box of Isagenix IsaLean Bars come with 10 bars each.